In this article, we will learn what is IEnumerator and IEnumberable, as we know that IEnumerator is an interface. we will see difference between IEnumerator and IEnumerable using Console Application. Let's start, with example create a new console application and do it practically step by step. IEnumerator Interface : An Enumerator implements IEnumerator Interface.It has two methods called MoveNext and Reset. It has a property called Current. IEnumerable Interface: An Enumerable implements the IEnumerable interface. 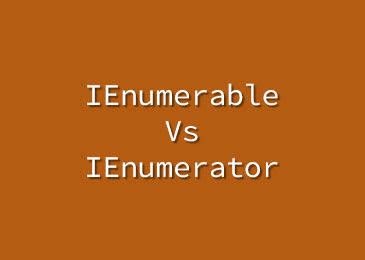 The IEnumerable interface has only one method which is GetEnumerator, which returns an enumerator. Now we are going to differentiate between IEnumerator and IEnumerable. 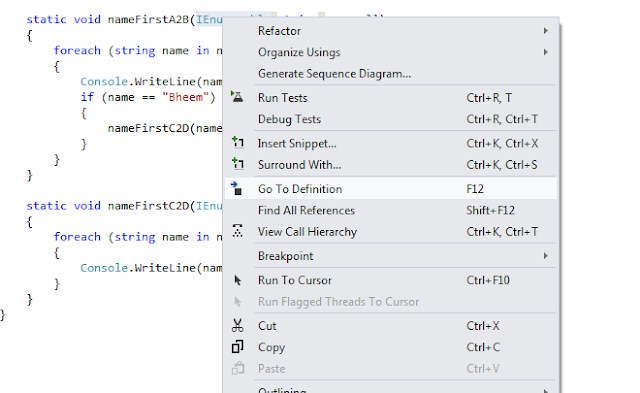 After that I read values from namelist which is string type list using IEnumerator. Convert list into IEnumerator and print it. 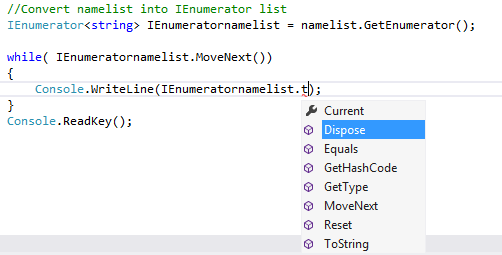 After that you can see the name list using IEnumerable. First convert name list into IEnumerable list . Now we can see that same name list print using IEnumerator and IEnumerable, both output are same here but code is different. Here we can see the code difference. 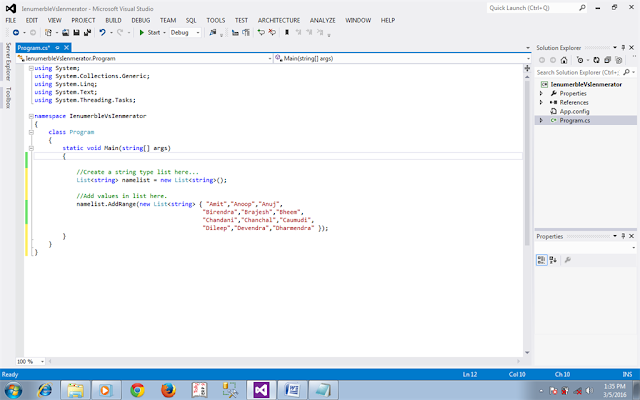 In IEnumerator list uses while loop but IEnumerable list uses foreach loop; the second thing is that in while loop IEnumeratornamelist contains .Current method but IEnumerablenamelist does not contain it. And we can see more differences. IEnumeratornamev list contains some methods shown below. 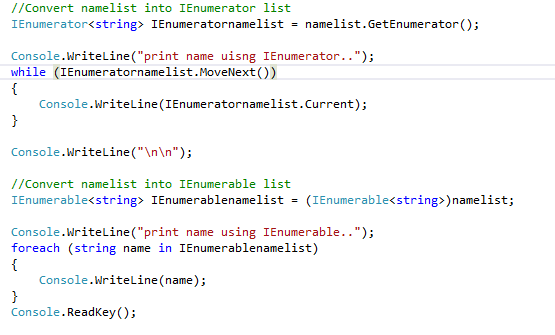 Without using any method it prints name list code like this. If we want to print those names which start from A and B first after that C and D using IEnumerator and IEnumerable different methods like here. First method nameFirstA2B prints name which starts from and A and B. But nameFirstC2D prints name which starts from C and D. When it checks condition if nameall equal Bheem then call nameFirstC2D it means IEnumerator contains his position that which position condition is true then it goes to nameFirstC2D with his position and works on behalf of position. Using IEnumerable methods : here condition is checked that name ==”Bheem” then go to nameFirstC2D method and it should contain Chandani because it comes after Bheem but if it contains Amit it means it again initialized from the beginning of nameall (0 index). Here the first main difference is that IEnumerator contains his position but IEnumerable does not. Go to IEnumerable definition IEnumerable internally call IEnumerator. 1 1. IEnumerator always contains his position (state) which index is stay but IEnumerable does not. 2. IEnumerable internally call IEnumerator. 3. IEnumerable is easier for developers to use and write less code.